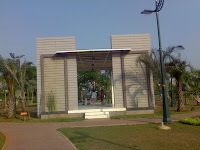 Mall of Indonesia was located in the complex Kelapa Gading Square, a very complete complex. 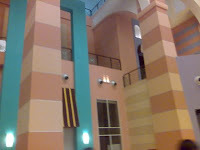 From Residence, Apartement, Ruko, Rukan to Mall (that on the mall had the house also). Indeed not yet many tenant that operated to this mall (the writer did not know, the complex has been declared or not yet), but big tenants as Carrefour, Centro and Megaplex Blitz have been busy enough to be visited. 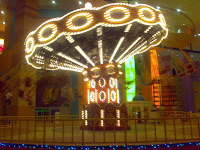 In MOI this was available the playing arena for children, like the Komidi Putar and the other game -followed the names in Dufan Ancol- like Pontang-panting, the Gondola, etc.. The difference with the machine in Ancol, in MOI, it size was smaller/mini and not hot if during the day. The lifestyle at this time often was mentioned with the lifestyle sedentary, that is physically more inactive. 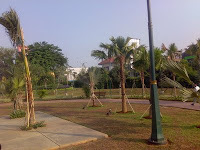 It was very good in each opportunity was utilized to process physical like in the Jogging Park at Kelapa Gading. This park was just declared several previous months. Several of his crops then still were seen just. And one of the important facilitis was provided the arena jogging that was based on the stones. There are measuring stones normally, there were also those who are very small. Borne was sick dech if disregarding this route, provided that not using the footwear. 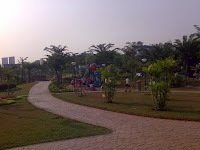 Usually to the Jogging Park had the event also. Sepertinya sangat nyaman berjoging ria di Taman Joging Kelapa Gading.. Tak hanya menyehatkan badan, namun juga menyegarkan mata karena kita dapat berjoging dan melihat pepohonan dan rerumputan hijau di sekitarnya.